Deeply lobed leaf of Hawthorn May blossom Hawthorn bush with may blossom. It flowers after the leaves have emerged. 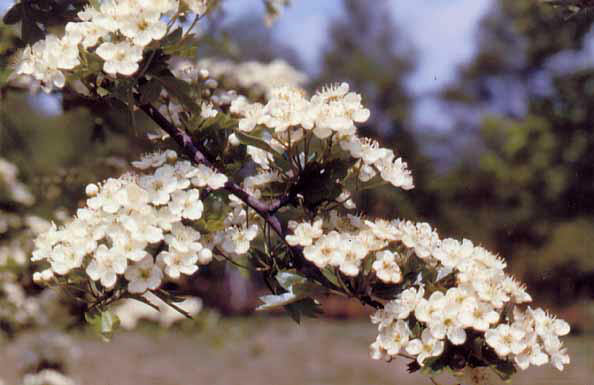 Crataegus laevigata. 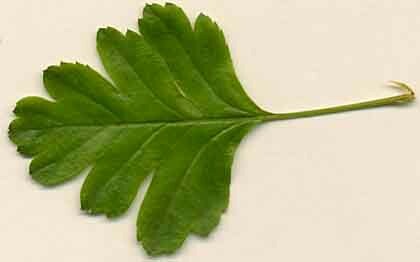 The leaves are less lobed than the common Hawthorn. Leaves and fruit of Midland hawthorn. Midland hawthorn is a tree of ancient woodlands and old hedgerows. Twig of Broad-leaved Cockspur Thorn Crataegus persimilis 'Prunifolia' present in the plantation. Thorns are 2-3 cms. Old Hawthorn on Dog Kennel Hill. 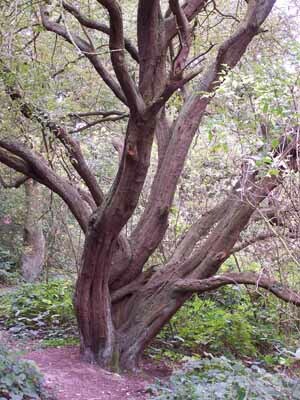 There are many old Hawthorns in the forest. 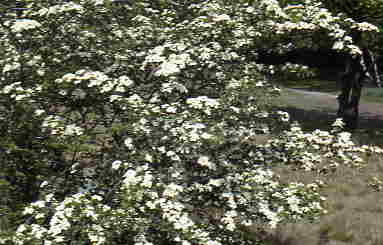 Hawthorn, May, Whitethorn or Quickthorn is a hedgerow tree widely planted in the 18th & 19th centuries. In the forest it occurs as a scrub species although there are some very old trees scattered about especially on Dog Kennel Hill possibly as a result of planting in the 1850's following the loss of Kingswood and the setting up of farms including Foxburrows Farm. Hawthorn comes into flower - May blossom - in the spring after the young green leaves appear. 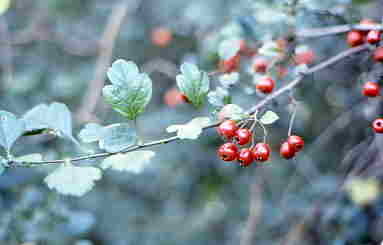 Its red fruits 'Haws' are sought after in the autumn and winter by the winter visitors such as Redwings and Fieldfares. The Midland hawthorn C. laevigata occurs occasionally in the forest and is a true woodland species. The leaves are less lobed than in the Hawthorn. In the plantation near the Latchford Gate is a Broad-leaved cockspur thorn C. persimilis. The flowers are similar to the Hawthorn but the leaves are not lobed. A feature are the vicious thorns on the twigs which lie hidden among the foliage in the summer months, a trap for the unwary!